The body of this H.E. grenade, formerly known as the "Gammon Bomb," consists of a fabric bag, open at each end. The lower end of the bag is gathered, arid an elastic band inserted around the edge, while the upper end fits under a steel cup. The edge is clamped between the cup and the flange of timed plate fuse housing by four equally spaced rivets. A tin-plate cap, to the lower end of which is secured an aluminum primer tube, is screwed over the fuze housing. The grenade is fused with the Fuze No. 247 wound with 4 ½ in. of tape instead of the usual 12 in. The primer tube contains a C.E. pellet over whish is placed a felt washer. A central perforation in the pellet accommodates a Detonator No. 73 Mk 1 with a felt disc inserted between it and the bottom of the primer tube. The grenade is issued with the bag empty. The charge of plastic explosive is inserted through the bottom of the bag under local arrangements. The body of this H.E. 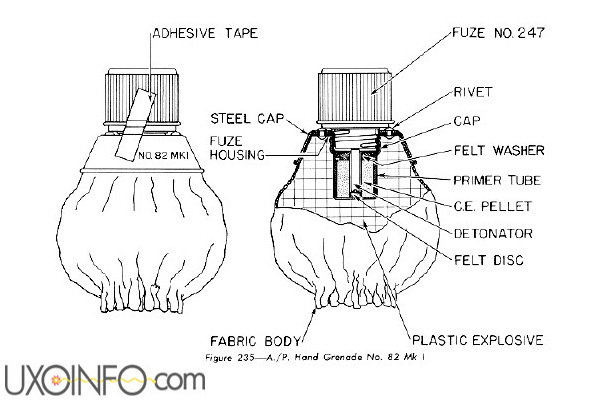 grenade, formerly known as the "Gammon Bomb," consists of a fabric bag, open at each end. First the grenade is primed and the plastic explosive inserted. The adhesive tape is then removed and the safety cap unscrewed in one-half of a turn. After the cap is removed, the tape mast be held in plate by the forefinger and thumb. When thrown, the weight on the end of the tape causes the tape to unwind and pull out the safety pin, Only the creep spring is now holding the striker away from the primer cap. On impact, the striker is forced into the primer cap, igniting the delay, which initiates the detonator and explodes the grenade.